Save money and never pay full price for anything with these 6 surprisingly easy tips! My husband likes to jokes that the only thing that I haven’t figured out how to get a discount on is our house. Crazy as that might sound, it really is almost true! You see, I’m one of those people that simply gets a kick out of figuring out ways to never pay full price for anything. It’s not that I will never pay full price, but if at all possible, I try to find a way to save money on whatever we’re buying. And over the years I’ve gotten to be pretty good at figuring out the tricks for saving on almost anything. In fact, at one point I even discovered a way to get a free annual Amazon Prime subscription! I think that was one of my favorite money saving moments ever, simply because I figured out how to save money on something that I had previously thought it impossible to save on! Anyway, if you are looking to save money too (and aren’t we all? ), here are the 6 surprisingly easy ways that I’ve found to save money on almost anything. Hopefully, they’ll help you save some money too! Coupons aren’t just for the grocery store (although coupons save me a lot of money there too!). Many times you can also save money by using coupons at restaurants, clothing stores, mechanic shops, home decor stores and more! Visit their website and take a quick look to see if they have any links to coupons. Sign up for their email club/mailing list. – A few of my favorites for this are JCPenney, Jo-Ann Fabrics, Red Robin, Ikea and Home Depot. Watch for flyers in the mail that have coupons. Use sites like Retail Me Not to see what coupons or discounts are available for specific stores. – This app mostly has savings for grocery items, but they also have started including savings for other stores too. Recently, thanks to Ibotta, I was able to save $5 on a $20 purchase at Jo-Ann Fabrics. Right now they also have offers for GNC, Ulta and H&M. And I’ve sometimes seen offers for restaurants like Ruby Tuesday, too. – Some gas stations even have cards like this that you can sign up for and save a certain amount off each gallon of gas! Helpful Tip: Create an email account that you use exclusively for offers like this, that way your personal email inbox doesn’t get cluttered by sale/coupon emails. Then you can just check your special email account once or twice a week to see what savings you might be able to take advantage of! I’m amazed at how often you can get an extra discount just because you simply asked. This is especially true if the item has any kind of flaw or if it’s a large purchase and you are paying cash. We recently needed to purchase a bathroom vanity and noticed that one of the vanities we were looking at had the countertop put on incorrectly. My husband knew that he could fix it, so he pointed out the flaw and asked if they would give us a discount, which they readily did. Another time we bought a large mirror that had a small chip in the frame. Again, we pointed out the flaw and wondered if there was any price break because of it. They gave it to us half price and we hung it with the flaw at the top where no one could even see it, so it was a major win for us! When it comes to saving money, patience is often one of your best friends! Why? Because often if you are willing to just be patient and wait, you can get almost anything that you are wanting to purchase at a discount because it goes on sale. Most stores have a sales cycle that they follow and most times they rotate their sales cycles to run every 4 to 6 weeks. This means that if you are willing to wait, the item you are wanting to purchase will likely go on sale sometime within the next 4 to 6 weeks. Another little trick is to pair a coupon with the sale to save even more money! For example, JCPenney frequently sends out $10 coupons. Recently I used one to buy two shirts for my son that were on sale for $5.99 each. By combining the $10 coupon with the sale I was able to get him 2 really nice shirts for just $0.99 a piece! If you are shopping online, an easy additional way to save money is by shopping through a cashback website like Ebates. Basically, shopping through Ebates allows you to earn a percentage back for your online purchase– up to 40%. The great thing is that you can also use coupon codes on your purchases too, to save even more! Sign up for Ebates and get $10 FREE! When you hear second hand, you probably automatically think of thrift stores and yard sales. And while they can be great for finding things for cheap, they aren’t the only place to look. I also love looking for second hand items on Ebay and Craigslist. The great thing about these sites is that you can search for the exact item that you want. In fact, a friend of mine recently was redecorating her home and wanted some specific Ikea furniture pieces. She lives in a big metropolitan area and decided to see if she could find the pieces on Craigslist instead of buying them new and paying full price. She had to be patient, but within a couple of months, she was able to get every piece that she wanted for much less than she would have had she bought them new! Love shopping online? Then daily deal sites are a great option for you to save money! There are lots of different daily deal sites out there. 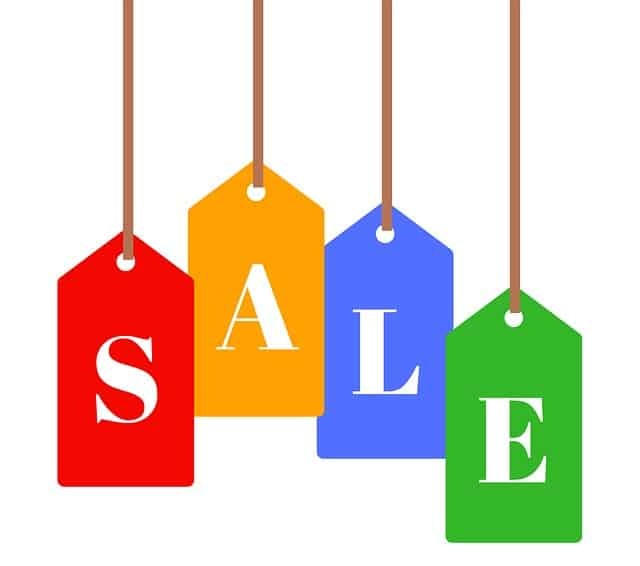 Some of my favorites are One Kings Lane (great for home decor and kitchen items), Groopdealz (home decor, baby & kids and a little clothing too) Zulily (clothing, home decor, household items, toys and more) and Groupon (savings on experiences and restaurants). WHAT ARE YOUR FAVORITE TIPS TO SAVE MONEY ON THE THINGS YOU BUY? I don't use coupons, but I always keep an eye out for grocery discounts. Our family also uses hand-me-down and free clothes to save money. It helps us save a lot of money! Yes, hand me downs and being able to get clothes from friends that their kids have outgrown is another great way to save money, for sure! I used your link to sign up for I botta .. Funny thing is my offers are mostly for alcohol. Strange. I hope to start using it soon. I bought most of last year's Christmas with your suggestions. Some of those coupons and online deals are amazing. Thanks so much for the post. Hi, This is my first time here. I found your blog via some social media site. I must you have an amazing blog. I really enjoyed reading your posts. Keep up the good work! J.C. Penney's pricing pranks have gotten really annoying. Deluging me with 20% off coupons after slapping a 30% markup on a product is not the way to my heart. I frequently see items at JCP that with a coupon cost more than the exact same item at Bed Bath and Beyond without a coupon. Guess that's why even when THE SALE OF THE CENTURY is under way you can still find a parking spot next to Penney's front door. Comparing prices is definitely always a good idea! And you just made me realize that I haven't received a JCP coupon in ages. Wonder why? The reason I mentioned them as one of my favorites is because they used to send me a $10 off $10 purchase coupon about once a month. And occasionally would also include a $10 off $25 coupon too. I could use those and get some amazing deals. And since we had a JCP not too far away, it was worth it for me. Where we've lived the past year, I'm no longer near a JCP and so I've kind of lost touch with what their sales are, and like I said, I haven't received a coupon in ages either.